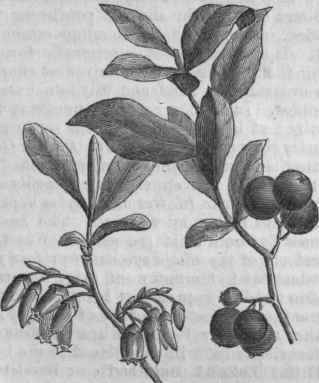 Hurtleberry Whortleberry, Or Huckleberry, the name of plants and their fruit of the genera Gaylussacia and vaccinium, constituting a suborder of the ericaceoe or heath family. 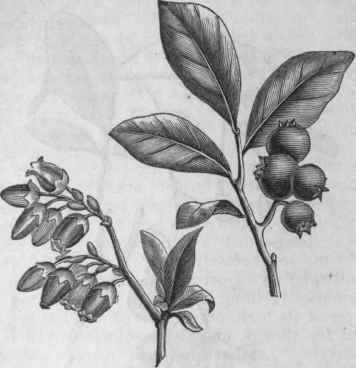 The form huckleberry is now generally used by American botanists and in trade. 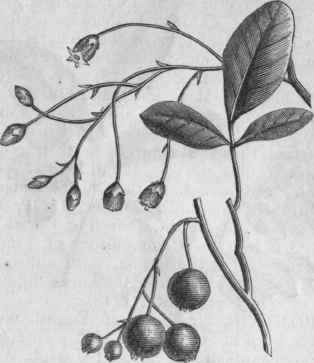 Formerly all the whortleberries were included in vaccinium; but as several differ essentially in the structure of the fruit, they were separated under Gaylussacia. Both genera are shrubs with scaly buds; the calyx adherent to the ovary, upon the top of which is the monopetalous tubular, bell-shaped, or variously formed corolla, including the eight to ten stamens; the fruit a usually edible berry, crowned with the short calyx teeth. In Gaylussacia the leaves of most species have resinous dots; the anthers open by a chink at the blunt or tapering top, and are awnless; the fruit is a compound drupe rather than a proper berry, and contains ten small, seed-like, one-seeded stones. In vaccinium, the leaves are without resinous dots; the cells of the anthers taper upward into a tube, which has a hole at the top for the escape of the pollen, and sometimes each cell bears an awn-like appendage on the back; the four to five cells of the fruit are sometimes divided into eight or ten cells by the growth of a partition as the fruit matures, but in either case are many-seeded. In both genera are species with evergreen and with deciduous leaves.. There are about 30 species of Gaylussacia in South America, and about five in the United States. The most important species is G. resinosa, so named on account of the resinous globules which are very conspicuous to the touch, and they are also abundant on the young leaves, rendering them viscid on the calyx and corolla; it is a much-branched shrub, 1 to 3 ft. high, with oval or oblong leaves; flowers in short, one-sided racemes, the corolla at first five-angled, conical and contracted at the mouth, at length cylindrical and open, reddish, tinged with yellowish green; the fruit globular and shining black, with a pleasant, slightly acid flavor. This is common except in the southwest, and is everywhere known as the black huckleberry, but dealers often distinguish the berries as crackers; they bear transportation better than any other, on account of their greater firmness.' A variety occasionally occurs with the berries nearly white, or with a pink tinge. The dwarf whortleberry (G. dumosa), about as tall as the preceding, is found in sandy soil near the coast from Maine to Florida; its leaves are hairy when young, but thick and shining when old; the long racemes of white flowers with conspicuous bracts, the ovary bristly, corolla bellshaped; fruit black and insipid. The dangleberry (G. frondosa), also called blue-tangle, is 3 to 6 ft. high, with spreading branches; its large, late fruit is by many regarded as superior to all others. - The genus vaccinium (an ancient name of obscure derivation) contains about 100 species, natives of temperate and subtropical Europe, Asia, and America, and is subdivided into several well marked subgenera. (See Bilbeeet, and Cranbeeey.) 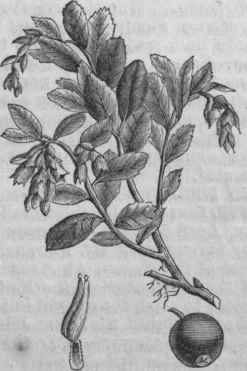 The species known here and in England as cowberry is V. vitis Idcea, a prostrate evergreen, with small, dark green, obovate leaves, bell-shaped pink flowers with four or five spreading lobes, and red, acid, bitterish, and somewhat astringent berries, much esteemed in northern Europe for preserving; it is found in northern New England, especially on the mountains. In New England the fruit of the vacciniums are generally called blueberries, though some of this genus have black fruit, when they are called huckleberries; the distinction, seldom made elsewhere, being founded on the color of the fruit, rather than on the plant producing it. The earliest fruit is afforded by the dwarf blueberry (V. Pennsyhanicum), a prostrate shrub rarely over a foot high, which in the northernmost states covers large tracts, bearing in July a profusion of large blue berries, with a dense bloom, very sweet, and so tender as hardly to bear transportation. The low or pale blueberry (V. vacillans) is erect, with pale leaves and branches, and bears a fruit similar to the preceding. The swamp blueberry or huckleberry (V. corymbosum) is one of the most common and variable species, and is found over a large portion of the country; it is from 5 to 10 ft. high, and often forms large clumps; its large white flowers are conspicuous; the fruit ripens the latest of all, and is either blue with a bloom or shining black, there being several marked varieties, which formerly ranked as species. - The picking of whortleberries for market is in some localities an important industry, and the business is as well systematized as that of marketing cultivated fruits. Whortleberries grow in such abundance spontaneously that no attempts have been made to improve them by cultivation. Several species are found only on the high mountains or along our northern border, which with others, including some evergreens, found only in the southern states, and often in restricted localities, being of no economical or commercial importance, need not be enumerated.